PSTN, SMS & GSM Voice. If you would like any more information or a current price list please contact us today. Installing a Speech Dialer for a Fire Alarm system should be considered a mandatory item. After all like the preverbal tree in the woods, if there is no one to hear it does it make a sound? Even if you have a manned 24hr security desk do you really want them hunting around for the emergency contact list instead of evacuating the building? Unlike most other types of Dialer on the market that are built in china using the cheapest components and are designed primarily for domestic environments, our M30 is a Professional Commercial Speech Dialer build for industry with high quality military strength components and has over 60 years of heritage behind it. 4, 8, 16, 56 Individual inputs. Each has their own user recordable speech message. Each can have their own SMS message. This allows you to easily differentiate between alarm inputs (e.g. parts or the building etc). As standard the M30 comes with 3 user selectable rosters / groups of 5 telephone numbers that will be called in the event of an alarm. (this is expandable). The M30 as standard will connect to your PSTN landline telephone network, but we now offer an optional bolt on GSM module as well. The GSM module allows you to use the GSM network full time instead of a PSTN land line or as a backup facility. When used as a backup the M30 will monitor the connected PSTN line and if it is cut or fails will automatically switch to the GSM mobile networks. You can phone the M30 from any phone at any time of the day or night to check the current status of the alarm inputs. The above list is not definitive; please visit the M30 Standard features and Optional features pages. SMS Text Messaging – As of January 2013 the M30 can now send SMS text messages in addition to speech messages. Setup is as simple as selecting in the menu whether you would like this alarm call to be voice or SMS. Telephone Line Backup – The M30 now has the ability to monitor your connected PSTN line, if it fails or is cut the M30 will automatically swap to the GSM network. The GSM network can also be used full time if you don’t have a PSTN line available. For More Information on the M30 visit the M30 Speech Dialer Standard Features and M30 Speech Dialer Optional Features pages or contact us for the latest price list. The M30 is an industrial GSM Speech and Text Dialler specifically built for harsh and commercial environments. 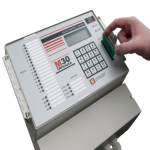 The M30 is used around the world by a large variety of companies to protect and monitor an array of situations including High / Low Temperatures, Freezer / Fridge Failures, Power Failures, Equipment Failures, Process Failures, High / Low Water Levels, High / Low Pressures, Security Systems, Building Management, Lone Worker Alarms, Computer Server Rooms, Human Life Support, Horticulture & Livestock Protection. As an industrial designed unit, it comes with all the features you might expect including, 4,8,16 and 56 individual inputs – each input has its own real speech and or SMS message, GSM and or PSTN network connections, 24 hour plus battery backup, and an IP56 enclosure. The M30 can use both the GSM mobile phone networks and also the PSTN land line networks to send out alarm messages. The GSM can be setup either as a permanent communication medium or act as a backup incase the PSTN landline is cut or has failed. Each input on the M30 has its own user recordable real speech message not a prerecorded or robotic voice; you can setup the unit to say what ever you wish. There is also a general machine identification message to allow you to easily differentiate between multiple machines and also to comply with BT regulations. Each input on the M30 has its own individual text message, plus there is general machine identification message, this is to allow you to easily differentiate between multiple machines. When an alarm or alarms are activated you will receive a message for each active alarm, e.g. if 4 alarms/channels where active you would receive 4 messages. So instead of a “channel 1“alarm message you will receive a more useful “This is Sunningdale Landfill, High temperature in boiler 1” message. The M30 is built and designed by us in the UK, so if there is a special feature or function you need for your application please let us know and normally we can get the feature added to the M30. Normally Open or Normally Closed alarm inputs. Each with their own Speech and or SMS message. User Recordable Real Speech alarm messages. 3 individual alarm callout groups / rosters each can have up to 5 telephone/SMS/ mobile/pager numbers (expandable). 1 additional Emergency group / roster. Your emergency group of telephone numbers can be permanently linked to a channel, so they only get called when that channel is activated. I.e. if channel 1 is your fire alarm you can set it up to call the fire brigade while all the other channels call the standard alarm callout group. GSM and or PSTN connections. You can phone the M30 from any phone at any time to check the current status of the alarm inputs. Fully menu and keypad driven.. The above is not a complete list of all the avaible features but just a selection of the highlights, visit the M30 Speech Dialler Standard and Optional features pages for a complete set or contact us for pricing. The M30 Speech Dialler is an industrial alarm monitoring device designed for harsh and critical commercial situations and environments. 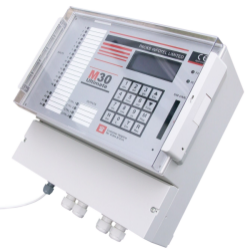 The M30 is used around the world by an assortment of different industries to monitor a large array of different situations including; High / Low temperatures, Equipment failures, Process failures, Power failures, High/Low water levels, Livestock monitoring, Security systems, Building management systems, Lone worker alarms, Generator protection, Horticulture protection plus many more. As an industrial device it comes with all the standard features you would expect including 4,8,16 & 56 separate inputs each with their own speech and or SMS message, PSTN and or GSM network connections, integrated mains failure alarm, integrated 24hr + battery backup and an IP56 enclosure to name a few – check out the features list below or visit the Standard features page to learn more. Each input on the M30 has its own totally independent user recordable speech message. Plus the M30 has a station identification message allowing you to not only comply with BT regulations but easily differentiate between multiple units/sites. When the M30 dials the on call personal they will hear the M30 report the units station identification and then the active alarm inputs e.g. This is the Windsor landfill alarm unit on 01344 874114, Failure on generator 1, Failure on flare stack 2 etc….. The alarm message is then repeated 3 times to make sure the on call personal gets the all the information. PSTN and or GSM connections. As standard the M30 connects to a standard PSTN landline, but we now offer a GSM option as well. This can work in 2 ways either as a dedicated GSM line – for use if no landline is available or wanted, or you can use it as a backup option. When the GSM module is used as a backup option, it will constantly monitor the connected PSTN landline, if the landline fails or is cut the M30 will automatically switch to the GSM network, insuring you are always covered. A new optional extra allows the M30 to send SMS text messages as well as Speech messages if desired. 4, 8, 16 & 56 Independent Switched inputs. Normally Open or Normally Closed contacts. Individual user recordable real speech alarm messages for each input. 3 separate alarm dialout groups / rosters each with 5 telephone/SMS/ mobile/pager numbers. This can be permanently linked to a single channel e.g. if input 1 was linked to your fire panel it can be setup to dial the fire brigade. While all the other inputs dial the standard Dialout group. You can phone the M30 at any time to check its current status. Integrated 24 hour battery backup. Fully Menu Driven with LCD and Keypad. The above feature list is not definitive so please check out the M30 Speech Dialler Standard and Optional features pages or contact us for pricing. The M30 GSM Alarm Dialler is an industrial / commercial unit designed for operating in harsh environments. The M30 comes with all the features you would expect from an industrial unit including; 4 to 56 independent inputs each with their own user recordable speech or SMS message and integrated 24+ hour battery backup to name a few – see the standard features page for a full list. The M30 Dialler now supports both Speech and SMS alarm messages. This can be individually configured for each Dialout. E.g. Dialout 1 to send a speech message to a land line, Dialout 2 to send a speech message to a mobile and Dialout 3 to send an SMS to a mobile. Unlike all other GSM Alarm diallers the M30 also has a PSTN connection, meaning if you wish, you can setup your unit to use the GSM network as a backup connection. I.e. The M30 will monitor your PSTN land line; if it fails or is cut it will automatically switch to the GSM network. If you would like more information or help on the features of the M30 please visit the standard or optional features pages or contact us directly. The M30 is designed and built by us in the UK so if there are any special features you require for your application, we will normally be happy to create them for you. If you have any questions or would like pricing please contact us. 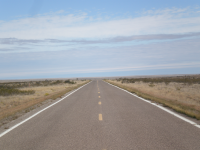 Having an unmanned site raises all sorts of questions about how you protect the sites security, the monitoring of any running equipment or processes to the welfare and safety of people or livestock. Most of those questions can be fixed by installing various types of monitoring and or alarm systems. Of course you can have the most advanced alarm system on the planet, monitoring every aspect of your unmanned site, with the loudest bells and strobes. But like the proverbial tree in the forest if there is no one around to hear and respond to the alarm you might as well just have an empty box on the wall. This is where the M30 Unmanned Site Alarm Dialler comes in – The M30 connects to your current alarm system or you can wire in all your sensors and monitoring equipment direct to the M30. 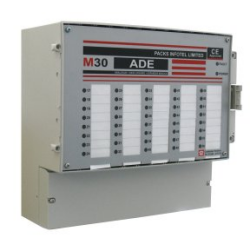 When the M30 receives an alarm signal it will automatically communicate this to the preprogrammed emergency contact list to inform the current on call personal that there is a problem on site. The M30 can connect either to a local PSTN landline or to the GSM mobile phone networks; depending on what you have setup the M30 can send user recordable real speech alarm messages, SMS text messages or data to pagers. If you worried about your landline failing or being deliberately tampered with, the M30 can monitor the connected PSTN land line, if this fails or is cut the M30 will automatically switch across to the GSM networks. The M30 can also trigger an onsite alarm siren or strobe if you wish. Because the M30 is designed and built by ourselves in the UK if there is a special function you need for your application then we will normally be happy to create it for you. The above list is only a small selection of the M30 features, for more comprehensive information please contact us or visit the standard or optional features pages. The Packs Infotel M30 SMS Dialler is a purpose built and designed machine for the types of harsh environments typically found in industrial and commercial applications. 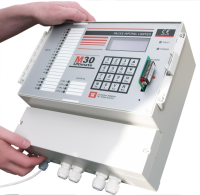 THe M30 comes with 4,8,16 or 56 individual inputs as well as all the standard features you would expect from an industrial SMS Dialler including 24 hour battery backup. The M30 is used all over the world in a diverse collection of applications such as Pharmaceutical, Power Generation, Security, Cold Storage, Oil / Gas Refineries, Building Management, Food production, Industrial Process Monitoring as well as the protection of humans and livestock. Each individual input of the M30 from 4 to 56 inputs has its own SMS message that is user configurable to about 25 ASCII characters plus each M30 has a station identification, this gives you an easy way to identify from which machine the SMS arrived. When the M30 goes into alarm and sends the SMS messages to the predefined contact list the end user will receive an individual text message for each input/channel that is in alarm. So for instance if inputs/channels 1, 2, 3 and 4 were active the recipient would get four SMS messages. 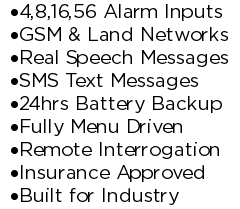 SMS and or Real Speech Messages over PSTN or GSM networks. The M30 is unique as it allows you the flexibility of not just sending SMS messages but voice messages as well. With the M30 you can also send user recordable real speech voice messages over a connected PSTN land line connection or with an optional module send them over the GSM networks as well. 4, 8, 16 or 56 independent alarm inputs. 3 separate Rosters (dial out lists). The above list is not definitive, also as the M30 is designed and built by ourselves in the UK if there is a feature or function you need for your particular applications then please let us know as we can normally create it for you. For more information or pricing on our M30 Auto Dialer please contact us or visit the SMS Dialler page on our site. There is also a now a dedicated SMS section on our Blog. As of the winter of 2012/13 we have added another new feature to our M30 Alarm Dialler, the ability to send SMS messages in addition to the standard voice messages. Each input/channel on the M30 can be configured with a user defined text message of around 25 ASCII characters – so instead of a recipient getting a useless “channel 1” alarm they can receive a useful “Mains Failure Boiler one” message. This feature is in addition to the standard voice message option so you can still setup and send user recordable voice messages over the PSTN networks or over the GSM networks with the GSM converter. Setting up your M30 is very simple; while entering your alarm contacts phone numbers you can select whether the recipient should get a SMS or a voice message. The station identification is a maximum of 31 ASCII Characters. All inputs can have an individual identifying text message of up to 25 ASCII characters. When the M30 detects an active alarm/s it will send an individual SMS message for each active input to the predefined recipients. E.g. if 4 inputs are active then the on call engineer would get 4 SMS’s. Each SMS message is created from the M30’s Station ID (in <> brackets) and the inputs individual message and then followed by an *End of Message*. For more information of the SMS upgrade visit the SMS Feature page or the SMS section on our Blog.